Will GOP Swing State Governors Strip & Flip Donald Trump into the White House? As the Democratic Convention opens in Philadelphia, there’s just one one clear message that matters from the Republicans: Donald Trump will be within ten points of Hillary Clinton in the fall election. Thus, unless the Democrats do something about the issue of election protection, it will be within the power of key GOP swing state governors to give Donald Trump the presidency. For all its problems, the wildly disorganized and fractious gathering in Cleveland all boiled down to Trump’s final speech. It was rambling and often incoherent. But it delivered the classic strongman message: You need ME to protect you. Given the chaos, violence, and injustice of imperial America in 2016, that message is almost certain to sell with enough Americans to keep Trump close enough to Hillary Clinton to allow the election to be electronically stripped and flipped. In 2008 and 2012, Barack Obama was able to overcome these barriers with a huge popular margin in more states than the GOP could reasonably steal. This year, in a close election, given how the mechanics of our election system operate, the decision of who will enter the White House will be in the hands of the GOP governors of such swing states as Florida, North Carolina, Ohio, Michigan, Iowa and Arizona. Those will be the only six votes that really count in November. Should all or most of these governors (with their GOP Secretaries of State) flip the vote count for Trump, he likely has a lock on the White House. Two major “strip and flip” forces can doom the Democrats in 2016. First, the GOP stripping of millions of suspected Democrats from the voter roles is proceeding. As Greg Palast reports in his brilliant new film, “The Best Democracy Money Can Buy – a Tale of Billionaires and Ballot Bandits,” computer programs coordinated by Kris Kobach, Kansas’s GOP secretary of state, are being used to disenfranchise millions of mostly African-American, Hispanic and young citizens. As exposed by Palast, the stripping technique entered the computer age in 2000, when Florida governor Jeb Bush dropped more than 90,000 blacks and Hispanics from the registration rolls in an election ultimately decided by 537 votes. 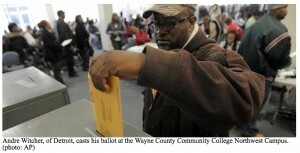 In 2004 the Ohio GOP stripped more than 300,000 inner city voters in an election decided by 118,775 officially, though more than 90,000 votes still remain uncounted. Palast shows that in 2016, the Democratic constituency will be electronically stripped of millions of voters in at least two dozen key states, easily enough to make the difference in a close election. But if that isn’t enough to put Trump in the White House, the final count can be flipped with computerized “adjustments” made in the dark hours of election night. In both Florida 2000 and Ohio 2004, electronic manipulation put and kept George W. Bush in the White House. In 2016, well over half the votes will be cast on electronic voting machines. Most of these are ten years old or more. All can be easily manipulated by their owners, which are private corporations, primarily Warren Buffett’s ES&S. The courts have ruled that the software on these machines is proprietary. So there is no effective public monitoring or accountability of the tallying process. At the end of election day, if they are in agreement with each other, the governor and secretary of state can make the vote count pretty much whatever they want. In a close election, the six key swing states electronically available to the GOP are likely to comprise more than enough votes to swing the Electoral College. The question is: will their governors give those electoral votes to Trump? North Carolina has also made adjustments to its vote count system, and has a Democratic secretary of state. But its disenfranchisement measures are legendary and could be decisive. Michigan, Iowa and Arizona could all be strip-and-flip locks for the GOP. So as always, Ohio may be the key. Governor John Kasich has made very clear his disdain for Donald Trump. But the US Senate race pits his good friend Rob Portman against the former Democratic governor Ted Strickland. Kasich may be willing to throw Trump under the bus. But he and his secretary of state, Jon Husted, will be strongly committed to sending Portman back to the Senate. Thus they won’t want the unlikely discrepancy of a GOP Senate victory alongside a GOP presidential loss. Whatever the case, no matter how many hundreds of millions are spent on this campaign, no matter how many thousands of hours the bloviators blab about this issue or that, when push comes to shove, this election will be decided on election night by the swing state governors and secretaries of state who have their hands on the electronic vote count. Thus, no matter what happens in Philadelphia, the smart money would be on Donald Trump entering the White House in January 2017. 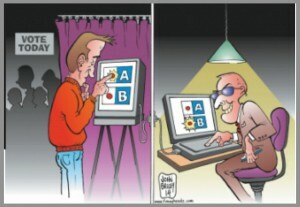 Bob Fitrakis & Harvey Wasserman’s Strip & Flip Selection of 2016: Five Jim Crows & Electronic Election Theft is at www.freepress.org, along with The Fitrakis Files. Harvey’s America at the Brink of Rebirth: The Organic Spiral of US History can be found at www.solartopia.org.